When it comes to learning grammar and AP Style, almost everyone can use some practice. Sometimes the best way to help your students perfect their writing is by encouraging them to test themselves. Here are a few online quizzes that will help them gain the confidence they need to become great writers. In one of my previous posts, I talked about journalism movies for the classroom. However, all of the movies were only appropriate for high school or middle school students due to PG-13 ratings. Here are some films that can be shown in elementary schools. Newsies is a musical from Walt Disney Pictures about the harsh conditions of newsboys in the late 19th century. Featuring historical information about the cutthroat world of newspapers, it educates and entertains. Since it follows young characters (all of the newsboys are in their teens or younger), it’s easy for kids to relate to. Plus the music numbers keep it interesting for elementary-aged students. 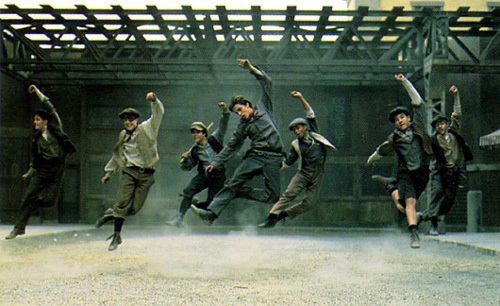 Starring a young Christian Bale and a not-so-young Robert Duvall, Newsies is packed with talent, emotion and song. Get a Clue, a Disney Channel Original Movie starring Lindsay Lohan, follows a journalist’s daughter (Lohan) and her friends as they try to uncover the mystery of their missing teacher. They use research and investigative reporting to crack the case, making it suitable for a journalism class. Lexy (Lohan) must also learn about the value of friendship over material items and discover that class and popularity are not the right ways to evaluate people. Thus, the movie teaches a variety of lessons appropriate for elementary school students. In The Great Muppet Caper, Kermit the Frog and Fozzie Bear work as newspaper reporters in this Muppet tale. The pair are sent to London to crack the story about a stolen necklace. You can teach students about investigative reporting and the importance of finding and reporting the truth. Also, the Muppets’ lighthearted nature makes this an ideal movie for elementary schoolers. Twitter and humor: What works? Twitter can be your friend when working with a high school publication. It allows your publication to interact with readers and use free promotion. However, can a publication use witty or humorous tweets? Though most publications don’t veer from the traditional news blurb, some humor and wit can go a long way when interacting with students. The Huffington Post‘s @HuffPostRhymes is a prime example of a professional (yet quirky) publication pulling off consistently humorous tweets. The account only tweets about news stories that rhyme. Though a publication shouldn’t only tweet jokes, it can be an effective tool to gain followers and respect. Try to create a witty element to use on your high school newspaper’s Twitter account. Here are a few ideas. Weird News Wednesday: Tweet about a bizarre news story on Wednesday. It can be worldwide, national or local. Trivia Tuesday: Ask your followers trivia questions about your community or high school’s history. That way you can educate your followers about the local environment and interact with them. Funny Picture Friday: Post a funny picture taken during the week. It can be a local, national or worldwide picture (attribute where it’s from, of course) that’s unusual or funny. 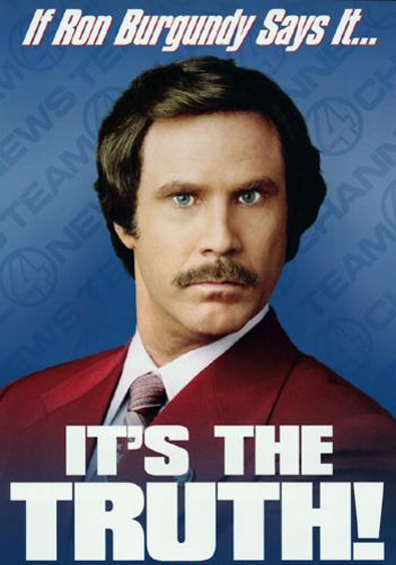 Ron Burgundy, Will Ferrell’s character from Anchorman: The Legend of Ron Burgundy, is a staple in pop culture. Though his antics are hilarious, he’s a terrible journalist. He’s unprepared, sexist and ignorant. A good journalist keeps it together, despite the circumstances, and remains professional at all costs. It allows you to build a reputable name. Don’t be ignorant about diversity. Diversity is key in journalism, as it allows many perspectives to tell a story. Acting like you’re better than everyone and “kind of a big deal” will turn others away from you. It’s important to be genuine and polite so you can create relationships with sources and other journalists. These relationships lead to better reporting which leads to better stories. Some teachers may view showing a movie as an easy way out of a lesson plan, but some journalism films can get students excited about learning about the world of the media. The thriller, based on John Grisham’s novel of the same name, concerns a law student (Julia Roberts) who partners with an investigative reporter (Denzel Washington) as they seek to uncover the mystery of the murder of two supreme court justices. Though the film is rated PG-13 and has some violence, it would be appropriate for high school students. Showing the film would be an effective segway to discussing investigative journalism and the use of anonymous sources. Since Washington is handles the political beat, classes could talk about the career option of covering politics as a journalist and what it would be like to work in Washington, D.C. Shattered Glass tells the story of reporter Stephen Glass (Hayden Christensen). Glass fabricates over half of his articles, and his lies are revealed. This film would allow a class to discuss journalism ethics and ethics in general. A basic lesson in media law would also fit in with this film. Due to the PG-13 rating, this film should be shown to high school students. Though this rom com isn’t as serious as most journalism-inspired dramas, it can still be utilized in a classroom setting. Sophie (Amanda Seyfried) is a young fact-checker for The New Yorker, but dreams of becoming a writer. She seeks to write a long feature story on the love letters women write to Juliet (yes, as in Shakespeare’s Romeo and Juliet) at the statue of Juliet in Verona. Since Sophie discovers the story herself, a class could discuss enterprise stories and how to find news. At the end of the film, Sophie is promoted to being a reporter, so a class could discuss how to make oneself stand out while in an entry-level position (like a fact-checker). This film is also rated PG-13, but can probably be shown to both high school and middle school students. The help follows journalism graduate Skeeter (Emma Stone) as she searches for a job in 1960s Jackson, Miss. Skeeter is troubled by the unfair treatment of the African American maids in her hometown, and decides to write a nonfiction novel about their lives. However, it’s not easy to convince the maids to talk to her, as they are fearful that they will lose their jobs for talking about their treatment. A class could discuss how to talk with sources who may not want to be interviewed and how to handle anonymous sources. A class could also discuss the difficulties of writing a story on a taboo topic, as Skeeter writes on racism in the 1960s South. Social media is an important tool for today’s journalists. All national publications, like The New York Times and The Los Angeles Times, use Twitter and Facebook to connect with their readers. Why wouldn’t you allow your high school journalism students to get a jump start on the marriage of social media and journalism? Though Facebook allows you to type as much as you want, Twitter seems to be more relevant in terms of connecting journalists and their readers. It’s quick and simple. Plus, people with Twitter accounts can create their own news home page by following accounts that interest them. Adding your Twitter handle to your publication is an easy way to let your readers know about your role in social media. Plus, you can incorporate your social media accounts with any advertising or marketing your publication may participate in. For example, you can put your publication’s Twitter handle on a T shirt. Best of all, social media is free publicity that you control.